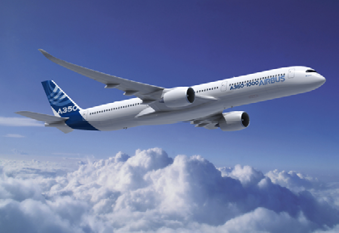 The A350 is Airbus’ first aircraft employing primarily carbon-fibre-reinforced polymer in its fuselage and wings. 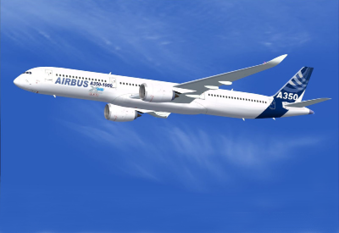 Initially conceived as a development of the A330 fuselage, the A350 was ultimately redesigned with a wider fuselage cross section in addition to a new wing, tail and cockpit, and this redesigned version was formally launched in 2006. Able to seat 366 passengers in a standard three-cabin configuration, the A350-1000 has a range of up to 8,000 nautical miles. It will therefore compete with Boeing’s 777-300ER (and the future 777X) and replace the A340-600. Aside from overall length, it will be distinguishable from the smaller A350-900 by a six-wheeled undercarriage and, as with the -900, Qatar Airways will launch the aircraft in mid-2017. For the latest updates direct to your inbox, subscribe to our email newsletter. © AXON Aviation Group 2015.